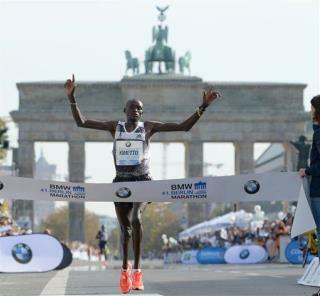 (Newser) – Six years to the day after Haile Gebrselassie became the first runner to finish a marathon in under 2 hours, 4 minutes, another Berlin Marathon runner has cracked the 2 hours, 3 minutes mark. Dennis Kimetto of Kenya won the race and knocked a full 26 seconds off the world record yesterday, finishing in 2:02:57, reports Reuters. "I feel good because I won a very tough race," the 30-year-old told reporters afterward. "I felt good from the start, and in the last 5 kilometers I felt I could do it." His previous best marathon time was last year's Chicago Marathon-winning 2:03:45. Freaking 5 minute miles. I've ran a 6 min mile once and that was hard enough.